These strange-looking brown stems of field horsetail come up in mid-April. The dark “teeth” on the stems are leaves. After spreading spores from the “cones” on top, these stems die back in early May. Then green, jointed bamboo-like stems appear and grow wiry branches that reminded people in bygone days of a horse’s tail. Brown is the color of Westborough’s woods in the first weeks of April – no white stuff this year, aside from a few flurries, thank you very much – but a curious thing happens in brown at this time of year. Poking up among the dried leaves and dead grasses at the side of some trails, strange stems appear in mid-April. They’re oddly fleshy-looking – tan and brown – with cone-like tops. They grow only 6-12 inches high, but when you spot one, you’ll probably notice others nearby, making a patch. What could these curious things be? It’s spring, a time when plant reproduction gets going (as the pollen counts remind us), but these strange stems have no flowers, pollen, or seeds. They’re special stems of a native plant known as field horsetail (Equisetum arvense), a relative of the ferns. The name horsetail seems to make no sense at this time of year, when field horsetail puts up these brown stems to spread its spores. The similarity to a horse’s tail becomes a little clearer once these stems die back in early May. Then field horsetail puts up another type of stem – a green one. The later, green stems are hollow and jointed so they look somewhat like bamboo. They sprout sets of thin, wiry green branches, which make the whole plant a look like a green bottlebrush or, to folks who spent more time with horses than most of us do today, a horse’s tail. Yet another old name was shave brush, since the upward-growing branches reminded people of an old-fashioned shaving brush. What about leaves? You might think that a relative of the ferns would be leafy, but no, horsetails have leaves that are greatly reduced so it’s hard to figure out where they are. They’re small, pointy sheaths that hug the stems at the swollen joints where branches grow out. You can seem them on the photo as bands of dark, pointed teeth along the tan stems. In field horsetail, both kinds of stem have these stem-hugging, tooth-like leaves. Getting back to field horsetail’s strange stems of April, what are the cone-like tops in the photo all about? They – and the entire brown stems – exist to spread spores. In this regard, they’re somewhat like mushrooms, which also exist to spread spores (but for an underground fungus). As the horsetail’s “cones” start to shed spores, they even look as if they’re covered with tiny mushroom caps. When the horsetail spores land on a suitable moist place on the ground, they sprout into tiny male and female plants. These little plants are barely visible, so we generally don’t see them. These tiny, short-lived plants produce male and female reproductive cells – eggs and sperm – and the sperm swim through moisture to the tiny female plants. Once the male and female cells unite, they grow into a new field horsetail plant, which can live many years, putting up spore-spreading brown stems each spring and regular green stems throughout the rest of each growing season. Most of the field horsetail stems that you see growing in a patch probably belong to just one or a few plants. 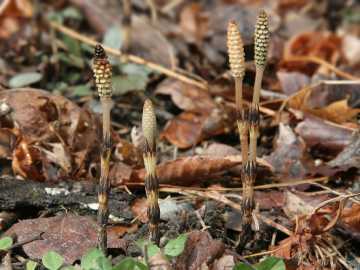 That’s because horsetails tend to spread in a favorable location by underground stems, known as rhizomes. The rhizomes grow out sideways and also downward. For this reason, field horsetails can grow in dry spots. Their rhizomes and roots can reach down 6 feet more to the underground water table. Where can you see field horsetails? At this time of year, you might spot the spore-spreading brown stems by the side of the Crane Swamp trail (in Mass Fish and Wildlife land east of Lyman Street). Look opposite the abandoned brick building found along the trail there. During the summer, look for spidery-looking green plants growing among the grasses and other vegetation along trails near streams and ponds at the Bowman Conservation Area and Headwaters Conservation Area. Horsetails often grow in moist areas, such as wet meadows and shores, but they can thrive in environments that are less suitable for other plants. For example, you might find horsetails along railroad beds. Other places include roadside fill, cracks in asphalt, sand dunes, and areas with mining operations. As the glaciers receded 18,000-9,000 years ago, horsetails may have been some of the early plants to grow on the newly uncovered, barren land that the glaciers had scraped. Like other plants, they moved up from more southern locations. Historically, people of North America found ways to put horsetails to use. Native Americans and early European settlers made a yellow dye from them. They also used horsetail stems by the handful to scour out cooking pots. They used them like sandpaper to smooth wood and polish metal. What gives horsetails their abrasive quality? Their stems and branches have gritty deposits of silica – a hard mineral substance also found in quartz and sand (and used in making glass and cement). Horsetail tea served as a Native American treatment for bladder and kidney problems. Field horsetails are the most common horsetails in our area, but there are others as well. Most grow in North America, but today’s largest horsetail grows 30 feet tall in South America. Some 300 million years ago, in the Carboniferous or coal-forming period, the ancestors of modern horsetails grew much larger. Some reached 50-100 feet tall. (Back then Massachusetts had a more tropical climate because it was part of a continent that was closer to the equator than we are today.) Over time, the heat and pressure of geologic processes turned their buried remains into coal, along with the remains of giant ferns and club mosses. Researchers have found fossils of these ancient giant horsetails, called Calamites, in eastern Massachusetts. Returning to the present, what else is happening in April? Westborough’s Mill Pond ospreys have arrived just in time for the start of fishing season. The pair returned to Mill Pond in the last week of March and appear to be nesting on the platform installed for that purpose a couple of years ago by volunteers from OAR (Organization for the Assabet River). The ospreys have finally given up on their old nest in a dead tree in the middle of the pond. The platform now has a shallow layer of sticks on it, and an osprey regularly spends time there. From Osprey Point, you can see the ospreys at the platform with binoculars.